Festive seasons always find my house with some guest or the other. Some stay or some come for breakfast, lunch or dinner. 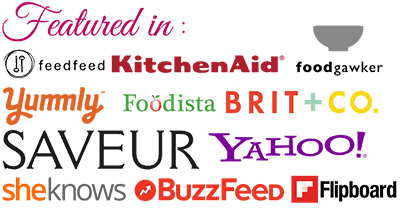 It is always a pleasure to cook something which is friendly to the most exacting pallet. One day as i sat flicking pages of a magazine which was among my treasured things, a yellow slip of paper slipped down. I picked it up and to my pleasure it was in my aunt’s handwriting, giving the recipe to make poha. My mind went down the memory lane. How in my childhood I used to wolf down this lovely red rice poha dish. 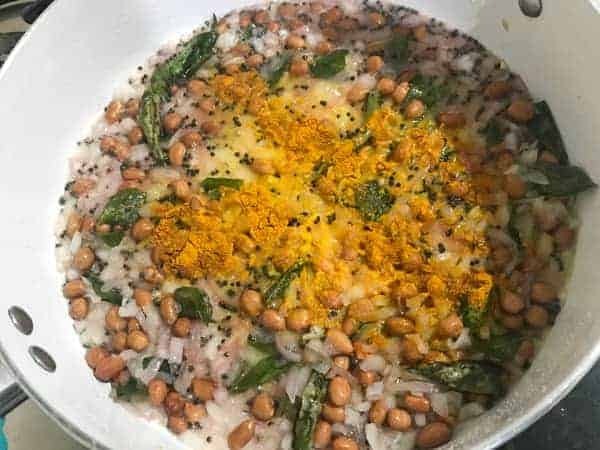 My unbound love for this kanda poha recipe was quite famous and my kindly neighbour used to call me whenever she would make it or bring a bowl of this all time favourite dish to my house for my delectation. 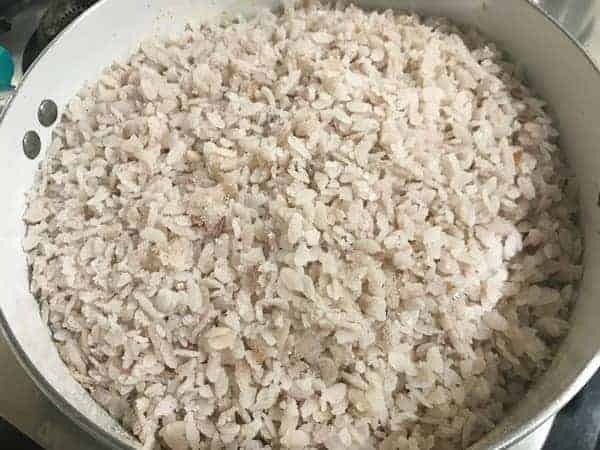 I used to love it so much that i used to request my mother to make it often. Its lightness and easily digestibility came to my knowledge only later. Poha in english is commonly known as beaten rice or flattened rice. 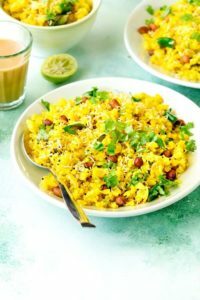 Call it a chura or aval or avalakki or chivda, poha is much loved popular Indian breakfast dish. 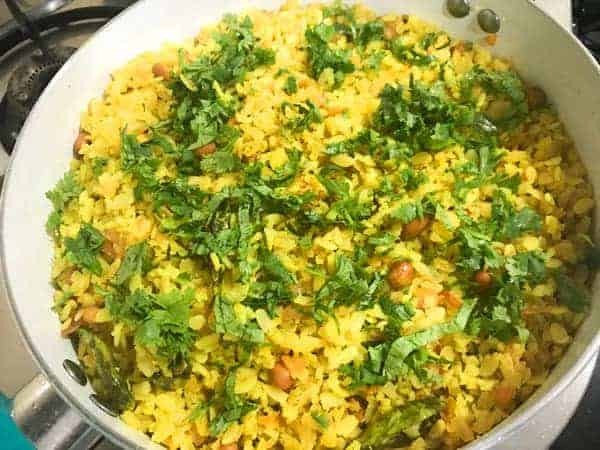 It indeed has number of variations like kanda poha or onion poha in Maharsahtra. The another variation is aloo poha or batata poha very well loved in Gujarat. Furthermore, another special variant is Indori Poha that uses the special masala called as jeeravan masala. There are variety of poha available, like thin variety, medium thick and thicker variety poha. The poha that I have been using to make poha recipe is of thicker variety and also rich in taste. Its high fibre content makes you feel full and contented for a longer period of time and helps in maintaining bowel health, lowers cholesterol, controls blood levels and also helps in weight loss, wow!! 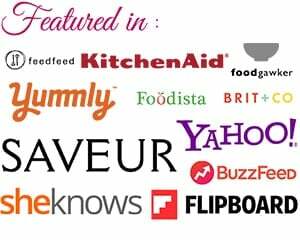 Weight loss…now that’s interesting isn’t it? This wonder rice flakes also helps in preventing anaemia because the iron in it carries oxygen to human blood cells. It helps increase metabolism rate also. Now that we are aware of its health benefits, let’s continue in glorifying this dish. Getting back to where I left the tongue and my stomach were more than satisfied by just having the dish. 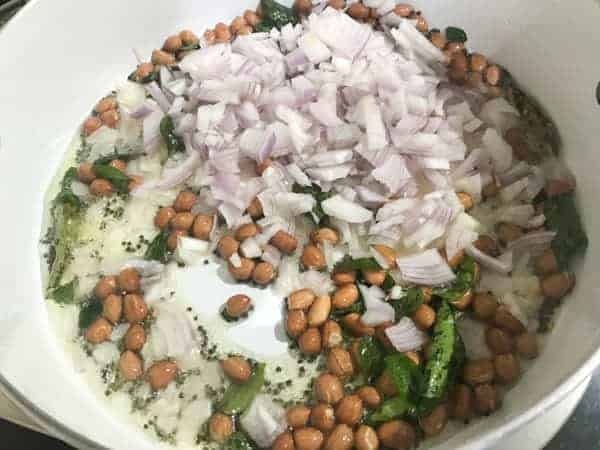 Looking pinkish with pieces of curry leaves coyly peeping out, green chillies providing the necessary spice, and the crisp groundnuts, making it tasty and inviting, it is certainly a dream dish. 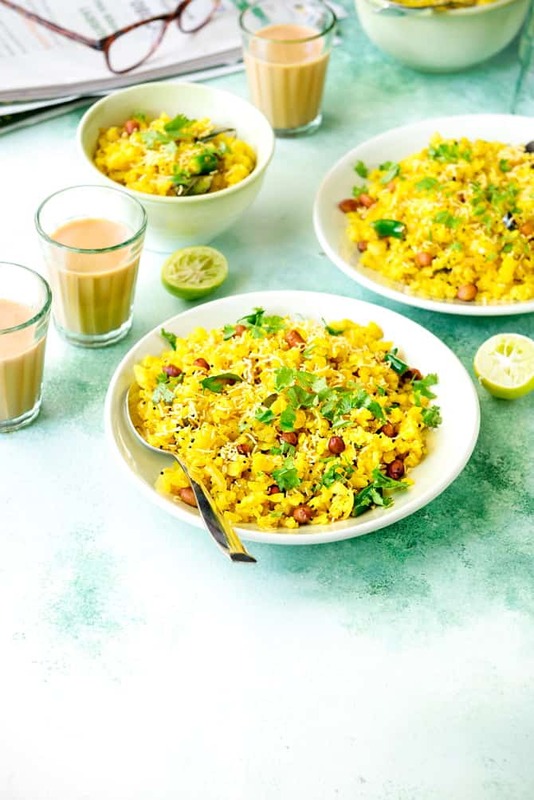 I love to serve this onion poha in the morning for breakfast and give the day a good start. 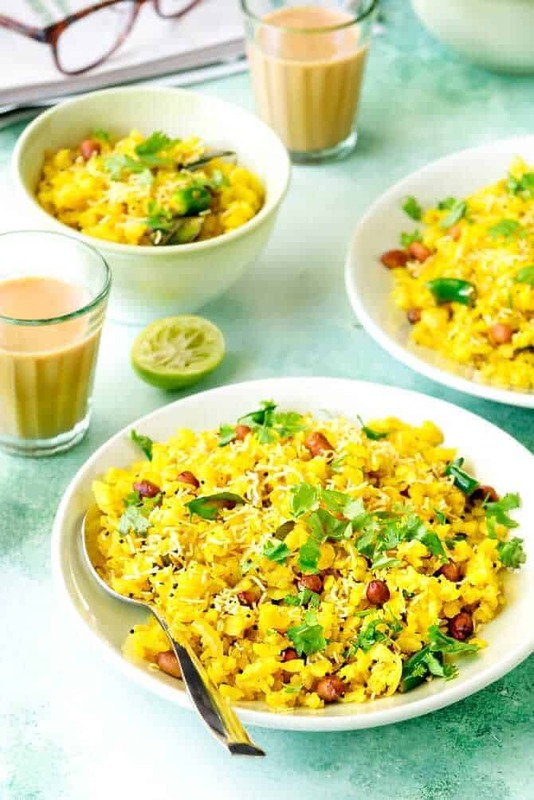 This kanda poha recipe is largely enjoyed as a Maharashtrian breakfast and even in Gujarat. It is a ‘must’ dish in all eateries, restaurants etc. It is very easy to make, and proves to be a dish which comes handy for any occasions. Unexpected guests, rainy days an apt company for travellers, so on…. No problem!! 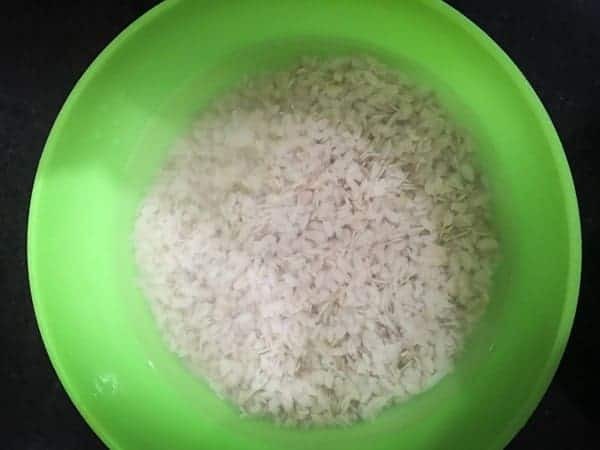 Poha Zindabad!! It has become very popular all over India, breaking the border and language barriers. Aval upma, Chivda, Rice flakes savoury it does enjoy many names. Besides being tasty, it is a nutritious dish. To make kanda poha Recipe, you can use white flattened rice as well as red rice poha. Here in this recipe of poha, i have opted for red rice poha variety. And as we are making onion poha, there has to be lot of chopped onions into it. 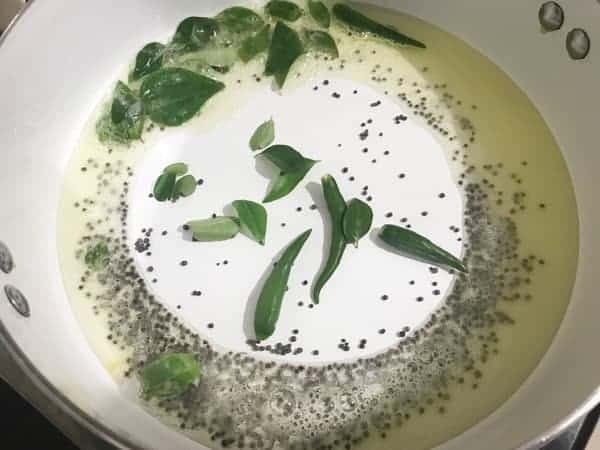 The other ingredients are peanuts, green chillies, curry leaves, mustard seeds, turmeric powder, sugar, salt, lemon juice and oil. Once the onion poha is ready to serve after cooking it, garnish with lots of coriander leaves, grated coconut and sev. 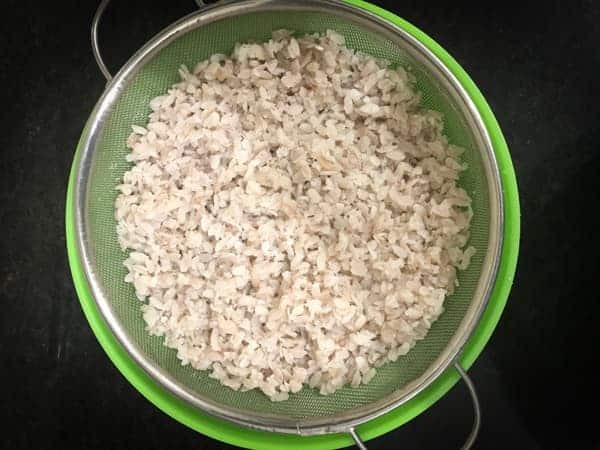 To begin with, first, clean and wash red rice poha and soak it for a minute along with little salt. After a minute, strain the poha and keep it aside. 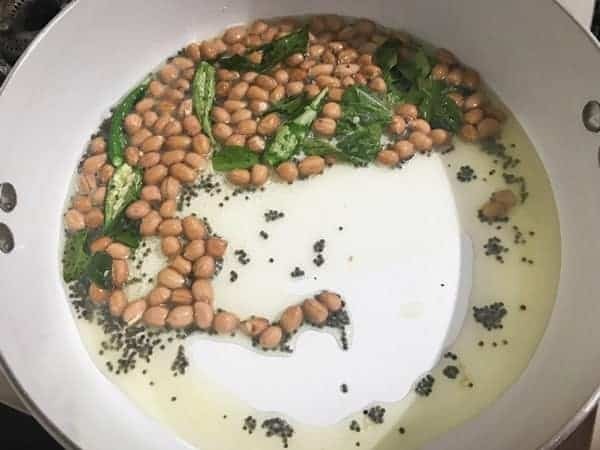 Add Peanuts and fry until it’s golden in colour and doesn’t get burnt. Then, add onions and sauté until they turn soft and pink. Finally, garnish kanda poha with coriander leaves and coconut (i have not added). Dish out and top with sev, serve hot.